Ever since breaking below the 30-week moving average in late 2016 gold and gold stocks have been in a sideways trading range unable to resume their uptrend. Gold and gold stocks have had three things working against them during this time frame: weak commodity markets, strong stock markets, and digesting gains from 2016. All three of those headwinds could be evaporating. We’ve certainly had enough time now to digest gains from 2016, with almost two years of sideways price action since then. In fact as measured by the ETF GDX, gold stocks have had one of the tightest Stage 1 bases I’ve seen. Over the last few weeks the price action in GDX has gotten extremely tight which often happens before a market experiences a big move. The same thing happened in 2016 where a fake breakdown lower was followed by a massive increase in buying pressure and trading volume which produced a phenomenal rally in gold stocks. What we need to see in GDX and the gold stocks is a big increase in volume and outperformance relative to the S&P 500 to confirm a break into a new Stage 2 rally. One thing to look out for is a fake breakdown below 21 for GDX, that could usher in a capitulation that could produce the conditions necessary for a big rally. 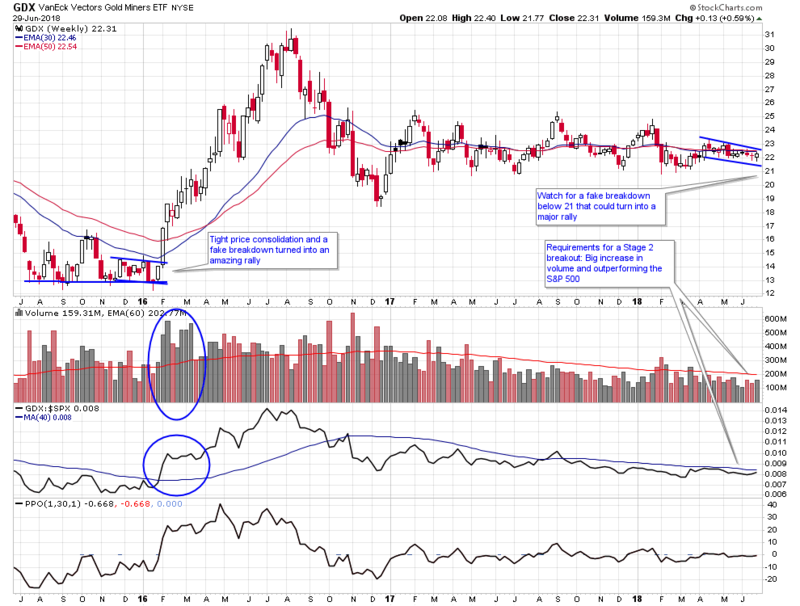 Gold could easily start a new rally on its own, but it would be helped by weak stock markets. Over the last two years there have been plenty of sectors in the stock market moving higher that have diverted capital away from gold. But over the last few weeks many foreign stock markets have broken down below the 30-week moving average, and this weakness is starting to bleed into U.S. stocks. Taking a look at the financials ETF XLF, it’s at a level where further weakness would be a potential new downtrend for this key sector. So to summarize gold and gold mining stocks are definitely worth paying attention to at the current time. 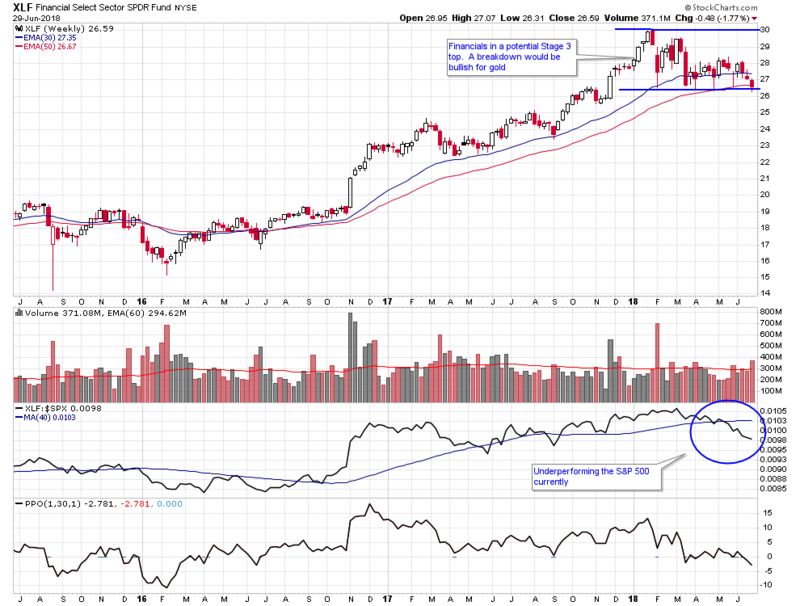 They’ve consolidated long enough to shake out the weak hands and be ready for a rally, and if certain things happen such as weak stock markets it could be enough to launch the rally into action. The views and opinions expressed are for informational purposes only, and should not be considered as investment advice. Please see the disclaimer.